yay! Cant see cos I'm at work at the mo looking forward to 'meeting' her! Thank you, David and Kelda! No mouse corpses yet, but this morning my computer mouse was mysteriously dangling from the desk. Hmmmmm...that has never happened before, so I think my little cat is a mischief maker! I put this on my blog, but thought I would show it off here too. 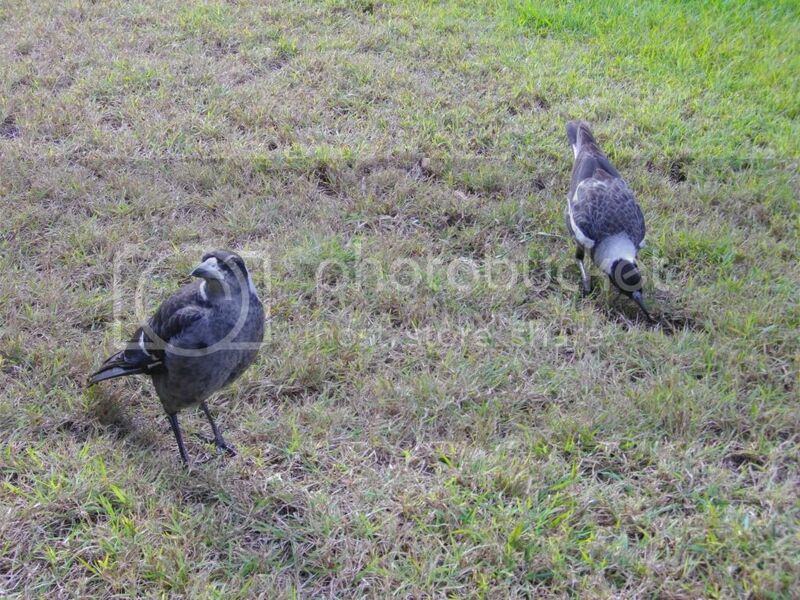 These are baby magpies, who come visit me for meat every day. They are full size but they are light in colour compared to the vivid black and white they will eventually be. Magpies are a protected species in australia. Aww! how cute! I love those magpies! I love their facial expressions! They look a bit angry but very cute and sweet at the same time. I'm glad you are taking care of them Sue. Can you pet them? Will they allow you to pet them? Have you ever tried? If I was there I'd probably try. We don't have magpies here (at least not to my knowledge) but I feed the squirrels and raccoons every day. I throw out all the scraps each night and the following morning the scraps are gone. I also feed the squirrels corn seed - the raccoons don't like the corn too much. They prefer bread and other scraps. I also throw any leftover bones into the yard for the coyotes. Everything is always gone the next morning. The birds are taken care of too. I feed them store bought bird feed. And the humming birds get sugar water in their feeders. Lately they have been going through two feeders of suger water every couple of days! We have an entire flock of humming birds living in the bush by the patio. Dad caught me sitting out on the patio petting a raccoon in my lap the other night. He got very angry with me. He said the animal could have bit me and given me rabies. He's probably correct. But they are so friendly and they've seen me numerous times out there feeding them at night. They know me. But he's right. I probably shouldn't do it anymore. Besides, I got bit last year trying to pull an injured raccoon off the road. So I really should know better. But they are so cute, and there is a big difference between an injured animal and a healthy and happy animal. Thanks for the cute pictures Sue! They sit on yor knee!?! wow! Awww David, I can relate to everything you do as far as all the animals go. And I know too, how good it feels when they trust you enough to come close or sit on your lap. Animals can tell who will be kind to them. No matter where we live, we always end up with lots of birds or animals around us. I'm sure they send word out through the "bush telegraph" that they can all get a feed at our place. And you do have to be careful, that you dont get bitten though. The thought of getting rabies is pretty scarey. Do you know that there are NO rabies here in Australia. Guess because we are an island, and strict quarantine regulations has not allowed it to get into the country. What you do with animals is part of who you are, it just comes natural, and its a wonderful way to be. Congrats on the new kitten, Shasta!! She looks adorable. And all kittens are mischievious. Oh yes! Absolutely! There's three of them that come around at night on a regular basis. They all know me. Sometimes they will keep their distance a little bit, but if I sit down and lure them over with a piece of bread they will sometimes jump up. I doubt I would be able to do that with other raccoons though- the ones that are not familiar with me. That's really interesting about Australia Sue. And very good news too! And it's probably because Australia is an island (a very BIG island) just like you said.